This excellent side dish salad is full of wonderfully crisp vegetables. The ramen soup mix is the perfect flavoring addition and you don't even have to measure anything! The toasted sesame seeds and nuts add a wonderful flavor and texture to this crunchy salad. And the flavoring packet from one of the Ramen noodle packages adds more wonderful flavor. You can add or subtract vegetables as you'd like to this easy recipe. Use sliced summer squash or zucchini, or add some frozen peas or sliced mushrooms. Serve this salad as an accompaniment to grilled steak, chicken, or salmon in the summer, or with meatloaf or a roasted chicken in the winter. Place the sesame seeds and almonds on a microwave-safe plate and microwave on high until lightly toasted and you can smell them toasting, about 2 to 3 minutes, stirring frequently during cooking. Set aside. In a large bowl, combine the cabbage, peppers, snow peas, and green onions. Crush the ramen noodles slightly and set aside. In a medium bowl, combine the oil, water, vinegar, sugar, and 1 seasoning packet from the Ramen noodle packages. Discard the remaining seasoning packet. Beat the dressing with a wire whisk until combined. 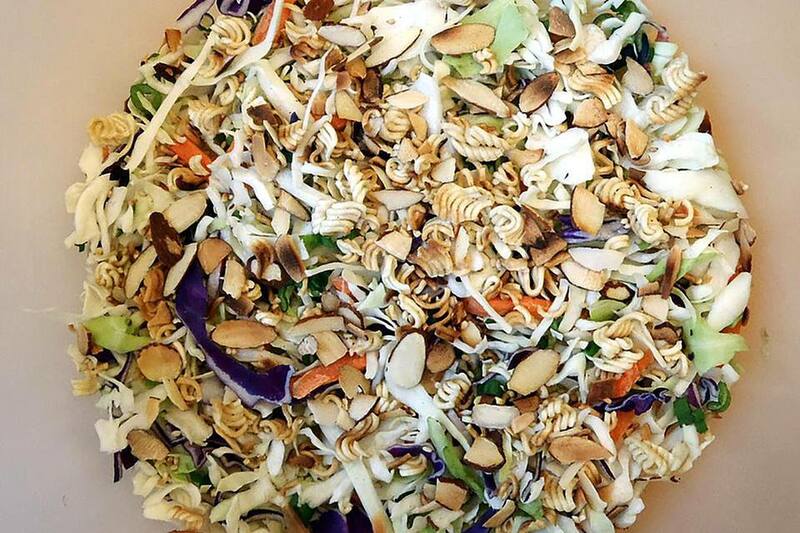 Just before serving, toss the crushed noodles, toasted almonds, and sesame seeds with the cabbage mixture.